When it comes to personality typing, the most effective way to type yourself is to understand the cognitive functions. For example, a lot of IFPs mistype as IFJs. This wouldn’t happen so often if tests and indicators asked questions that determined use of introverted feeling (Fi) or extraverted feeling (Fe). FPs use introverted feeling in the dominant or auxiliary position, and TJs use introverted feeling in the tertiary or inferior positions. FJs us extraverted feeling in the dominant or auxiliary position, and TPs use extraverted feeling in the tertiary or inferior positions. 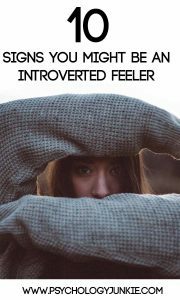 So What Is Introverted Feeling? Introverted feeling is a judging function. This means that it is what FPs use when they decide. It involves a deep awareness of one’s own values, morals, ethics, and emotions. Fi-users seek internal harmony and strive to live in accordance with a very personal set of values that are usually very private. You are determined to be “real” and honest in the way you live your life and interact with other people. Phony social niceties and small talk drive you crazy. When you spot insincerity from other people it’s an instant turn-off. You don’t always know where these feelings are coming from, but you get a strong “intuitive” hunch when something is out of line with your ethics and values. You become anxious and might even feel sick if you do something that goes against your values. Someone has to earn your trust in a big way before you’ll share your deepest feelings and values with them. You hate when you cry in front of people. You don’t really care so much what society or culture says you should look like or dress like. You like having your own unique tastes, styles, and preferences that feel true to you. Everyone has a right to their own unique set of values. Unless someone is hurting someone else or being a bully you don’t feel comfortable asking other people to conform to your set of morals and ethics. #6 – On the Outside You’re Easygoing. On the Inside You Have Strong Convictions. To others you might seem tolerant, open-minded, and accepting. On the inside, however, you hold yourself to a strict set of morals and core beliefs that you strive to remain true to no matter what opposition you face. Even if you are friendly, sociable, and outgoing, there’s a part of yourself that you tend to keep private and internalized. Some people might call you “mysterious” or “enigmatic”. Who you are is not for someone else to judge, and you feel uncomfortable judging other people or evaluating their performance. You feel like everyone has their own unique gifts to bring to the table and it doesn’t feel right to make judgments about how they do things unless it’s hurting someone else. You dislike conforming to a set of rules and structures that have been made by someone else. You love traveling, exploring, experimenting, and being independent. You hate being controlled or trapped. You’re good at picking up on emotions and other people’s feelings, especially one-on-one. You may even notice how others are feeling before they do! Do you relate to these signs? Share your thoughts in the comments! I think it could be very proach to an ISTP too. I’m Fe, but after a bad or good reaction of «Them» I become Fi. But It’s clearer. And I would like to be connect with a real positive Fi or equivalent. I use Fe to capte information integrate a group (often the bad for the challenge or facility) and seduction. But definitively it’s steril on the long term (also often on the short). And I would be a bad cop. A borderline like Dicaprio in The Departed. I find this question really hard to answer because to me “how will it impact them” and “how will it impact me” are intertwined depending on the situation. Knowing that something will negatively impact others will make it a matter of conscience for me. My conscience does not let me willfully harm others a d I know that if I do that decision will impact me gravely afterwards. My conclusion is that I don’t understand the abstraction of logic and rationality in an extraordinary situation. Similarly I don’t understand the emotional absence in the same situation. The first is a means to succeed, the second a purpose. Every single one really applies especially #4. I got into a feud with a roommate of mine where our feud was about my songwriting (something where I make the most of my Fi). The journey is always tough for an Fi-dom, and thank goodness I have to a point where I am able to use to use my dominant function to my advantage (I’m INFP). I really agree with #10 considering I’m someone who has tried getting SEVEN different results in all the personality tests I’ve taken. I am an INFJ, however, I am close to being a P. Spot on for me are #8, #9, and #10!!! Evaluations of people are a farce to me. Everyone brings their own gifts and talents to the table! I would say that I’m not “turned off” by someone trying for small talk especially if I don’t know them, only I find that it is like watching someone fiddling with their worry beads in order to sooth their anxieties. I answer normally to help put them at ease and if I find they are reiterating the same basic phrasing I will usually change the subject to get past their crutch for confining introductory social structure. Once they are engaged on another subject, this will usually break them out of that closed circuit pattern.